Retail investors are overwhelmed with information. Meanwhile the payload of these numerous analytics and market reviews is zero or even negative. Is a passive investment in an index ETF a solution to this problem? Yes, but not necessarily the best one. We provide a short list of S&P 500 stocks with good fundamentals, low volatilities and correlations and nice charts from technical point of view. A passive investment in an index ETF is a good solution for a lazy investor. 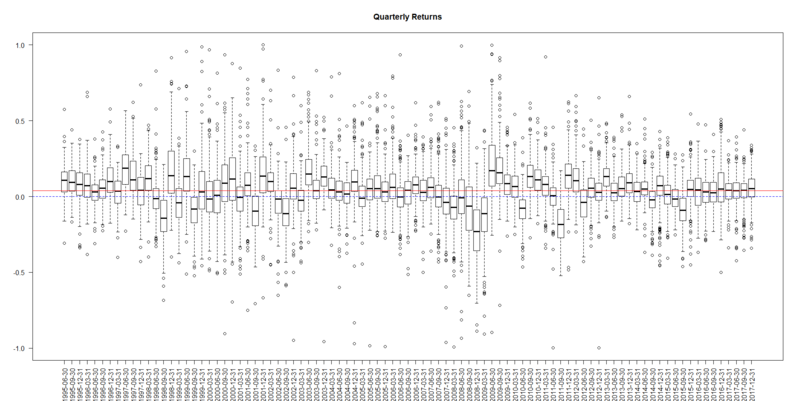 However, such lazy investors lose something, as the following boxplot of the quarterly returns shows, there are always some stocks (even during the crises) that perform good: their returns are above zero (blue dashed line). Whereas people are often skeptical about technical analysis, the quantitative fundamental analysis is often favored. And it does work in long term, as Piotroski&apos;s or Levermann&apos;s strategies clearly show. However, such strategies usually do not address the portfolio diversification issue, thus selecting "cheap stocks" may lead to an overconcentration in few economic sectors. E.g. if you currently choose 20% of the DAX stocks with the lowest P/E coefficient, half of them will be the automotive... but keeping DieselGate and E-Cars boom in mind I would be rather pessimistic about such portfolio. And completely ignoring the charts may also be suboptimal: although it is very hard to formalized the working rules of technical analysis, an experienced trader can read a lot from charts, at least sometimes. 1) first, we visually screened the charts of all stocks from SP500 index and identify those, which either trend strongly or might reverse soon after a correction. 2) then we check the most important fundamental values: first of all forward P/E, RoE and profit margin. 3) we also take care about diversification in order to avoid both sector overweights and too high statistical correlation between stock returns. All stocks selected in ShortList may, in principle be bought. A simple but sufficiently efficient rule for asset allocation is to invest 1% of capital in each stock. The rest of capital (47%) should be put in other asset classes, e.g. in T-Bonds. Alternatively, you may also consider the lowVOLA_lowPE_highRoE list, which contains the stocks with the lowest forward P/E and volatility and the highest RoE. Most of the stocks from this list can be bought immediately at market price but for some of them it makes sense to set a limit order. We recommend to invest (up to) 2% in each stock. You can buy this report just for €5. 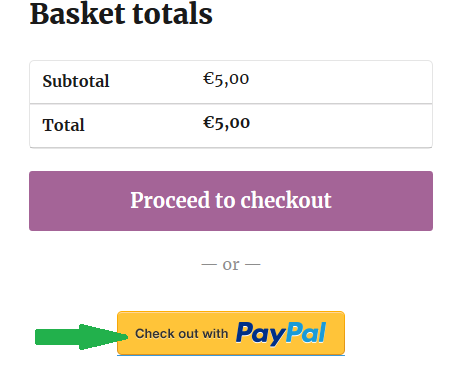 Unless you have a coupon for free download, choose check out with PayPal. If you still do not have a PayPal account, register and get €5 Welcome-Bonus, so you can have a report quasi-free of charge. 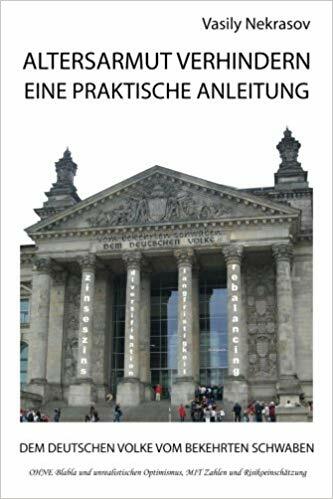 Moreover, if you have previously bought one of Vasily Nekrasov&apos;s books: Knowledge rather than Hope or ALTERSARMUT VERHINDERN: Eine Praktische Anleitung you are eligible to get a coupon and download the report for free. To get a coupon make a selfie with one of these books, publish it in your social network and send us a link. We will send you a 5€-coupon in return. Investment in stocks is risky. Even a portfolio of carefully selected stocks can suffer a drawdown. We keep and/or are going to trade all stocks specified in this report.